Here is a page with what I consider to be the best resources about Thailand Snakes online. Please keep in mind that information you find at any of the resources listed can be in error including information you find here at ThailandSnakes.com. That said, this is what we have available and overall these resources contain really helpful information. ThailandSnakes.com. My hobbyist site. Not comprehensive, but basically covers some snakes I’ve caught and that I have interest in. Thailand Snake Forum at Facebook. This forum makes it easy for comments, sharing, and photos to be shared from people across the country. If you’re active on Facebook, go have a look and “Like it” if you like it. Toxinology.com – from the University of Adelaide, Australia comes this amazing resource for snakes across the globe. An attempt was made to list all snakes with their crucial details, including first aid treatment recommendations. 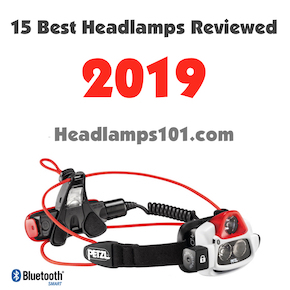 I use this site more than any other. There are snakes missing when country-wide searches are done though. Just like any resource, it’s not perfect, but it helps. IUCN Red List of Threatened Species. Searches on Thailand reptiles can be done to find out which are in danger of becoming extinct in the coming years. The Reptile Database. Seems to be comprehensive database of reptiles of Thailand and other countries in Asia and across the globe. Queen Saovabha Memorial Institute. This is what is frequently referred to as the “Bangkok Red Cross Snake Farm.” It is part of Chulalongkorn University and they have a number of functions. One is, they produce snake serum (antivenom) for some of the venomous snakes in Thailand. There are some very knowledgeable Thai staff working at the institute. There are daily snake shows and snake milking (venom extraction) demonstrations that make this worth a visit. There is both an outside snake exhibit (snakes in cages) and an interior exhibit (more snakes in cages) that covers a lot of different snakes of Thailand and even the occasional snake from another country or continent. Tom Charlton’s Flickr. Tom is a UK native who focuses on photographing snakes in Asia. Thailand species at CalPhotos (UC Berkeley photo collection). Thailand Herpetography. An excellent Facebook group with Thai herpers all over the country submitting photographs. Mostly in Thai language. Freehandling Venomous Snakes – Why? Where Can I Study Snakes? Why Use a Snake Guide? A Naturalist’s Guide to the Snakes of South-East Asia, Indraneil Das – Find here . A Field Guide to the Reptiles of Thailand – available in ebook. Find here . 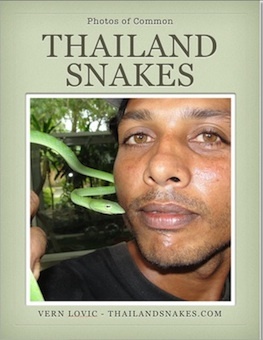 Brooks, Phil – Has had a snake rescue service on the island of Koh Samui since 2007. King cobra handler. 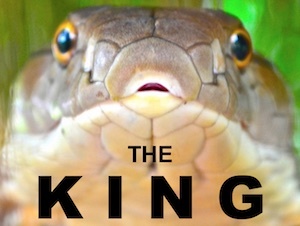 Charlton, Tom – Avid herper, photographer, and king cobra breeder, handler (and soon to be author of book on king cobras), located in the United Kingdom. Cota, Michael – Ex-researcher for Thailand’s Museum of Natural History. Frohlich, David – Avid herper in the Hua Hin area (facebook group). Currently not in Thailand. Gumprecht, Andreas – Avid herper, researcher, and author, Andreas has Gumprecht’s pit viper named after him – T. gumprechti. “Herp Guide” Parinya – Avid Thai herper and local expert on Thailand’s herpetofauna. Pauwels, Olivier – biologist living in Netherlands, but making frequent trips to Southeast Asia. Many publications describing new Thailand species. Pelling, Elliot – Avid herper in Krabi area. Also has traveled to find snakes in USA, Borneo, India, Indonesia, Malaysia, Sri Lanka, and lived in Taiwan for three years. Smits, Tony – Owner of Ton Ton Travel near Bangkok. Sumontha, Montri – Montri probably has his name on more journal articles about herps in Thailand than anyone else except maybe Lawan Chanholm. In the past he worked at the Queen Saovabha Memorial Institute in Bangkok. Vogel, Gernot – Author of books on Thailand and Southeast Asia snakes, T. vogeli – a pit viper, is named after him. 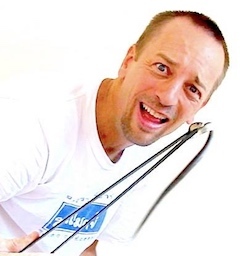 Wuster, Wolfgang – Researcher, author, and expert on Thailand’s snakes and other reptiles. NOTE – if there is any incorrect information above, do let me know! Hello, could you advise on what to do if you encounter a spitting cobra while wearing contacts? Would you leave then in or get them out? I’ve looked for information and can’t find any regarding this scenario. Thank you so much. You would need to remove them if you got venom in your eyes because the contacts would trap the venom underneath and you’ll need to rinse your eyes for 20 minutes – constantly flushing away the venom to prevent damage to your eyes.